Red Vines or Twizzlers? Pick a side. Two kinds of chewy psuedo-licorice, two completely different tastes. I am a Twizzlers kind of gal. I’ll eat Red Vines when camping, or on a car trip, but those are about the only times. My kids like both. 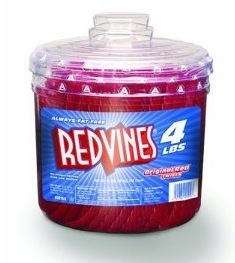 I think they favor Red Vines because they come in that huge tub from Costco. I prefer strawberry Twizzlers when they get a bit stale so there’s more chew. 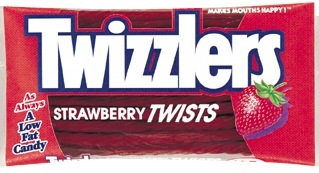 I really like chocolate Twizzlers, probably because they remind me of the penny candy counter of my youth. Red Vines seem like I’m eating red air. There isn’t much to them, and what flavor are they? I know that you can use them as a straw, and that’s a plus. So what do you think? Let me know…I’m curious. Posted in chewy candy, Childhood memories, licorice and tagged food, penny candy, red vines. Bookmark the permalink. I agree, there is better licorice out there. My favorite is Newman’s Own strawberry. Thanks for dropping by my blog.